Recently, a software update brought by Nokia featured the Pro Camera Mode in its stock Nokia Camera app. 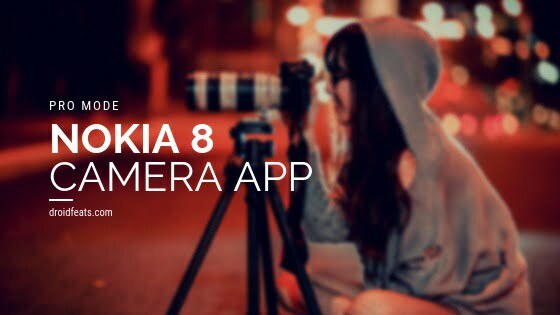 If you have been looking for Nokia 8 camera app download with pro camera mode and install it in your Android device, make sure that you read this piece till the end. Although a lot of improvements are being made, state we see that most of the OEM devices have stock camera apps that support automatic shooting modes. It works fine for a few devices thereby, allowing a user to take the camera settings at a certain degree while for the other handsets, it doesn’t meet up to the user’s satisfaction. The new software update bringing the Pro Camera Mode to the Nokia 8 Camera app, as updated by HMD Global exchange the overall camera experience of a user by adding an amazing feature that offers a certain degree of manual control to the users. Thus, it is gradually growing up to be one of the best mode available to the photography enthusiasts, gradually growing up to be a good alternative to the DSLR camera. Are user can choose to adjust the settings of the pro camera mode according to his or her preference. Some of the aspects include White Balance, ISO, Manual Exposure Compensation and Shutter Speed along with many others. Does it support your Android device? Your Android phone should support Level 3 Camera2 API in order to install Nokia 8 camera app pro camera mode. If you have phone does, you will easily be able to find ‘Level 3’ in green under the Hardware Level Support Category section. If your phone supports the mentioned API, you shall be downloading Nokia 8 Camera app with Pro Camera Mode or else you would be out of luck!. XDA Recognized Contributor linuxct successfully ported the Nokia 8 Camera app for other Android devices. It is an all-new ported app, based on the stock Nokia Camera app version 8.1041.71. At first, download Nokia 8 Camera App with Pro Camera Mode. Next, tap on the ‘hmdcamera_8.1041.71.apk‘ file. Now, you must follow the on-screen instructions and install Nokia 8 Camera App with Pro Camera Mode. Once the installation process is over, then open the app drawer and launch the new camera app. As you launch the app for the first time, you see prompts to seek required permissions. Then, you would see a few infographics. This would help you can get accustomed with the Nokia 8 camera app with pro camera mode. Finally, the viewfinder screen is launched. Simply swipe up the shutter button to enable Pro Mode on the Nokia 8 Camera app. Once you see the Pro Mode ring on the screen, you can move the control buttons to adjust white balance, shutter speed, ISO, and exposure compensation.